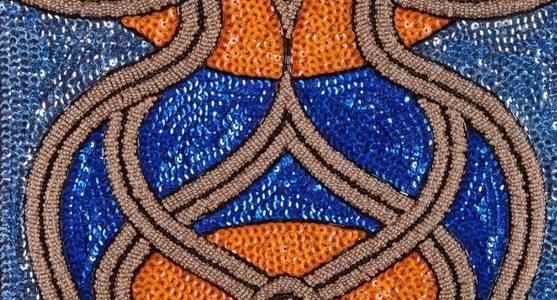 Claudia Apaid, a Haitian artist whose designs are inspired by her works of service, spirituality and nature, interweaves a variety of mixed media creations in handmade embroideries and metal works, often alongside artisans from around the globe. Apaid uses hand-stitched embroidery and techniques with sequins, crystals, glass beads, precious stones and metal to create her unique pieces. Described as vibrational pieces, her works of art are charged with Reiki energy while handcrafted with precise attention to detail. Complex patterns and cellular structures, both of which represent the universe, are weaved in a way creating a personal connection to all matter. With a focus of the repetitions and patterns found in nature and the spiritual worlds, Apaid explores and documents the very nature of life itself and our relationship with it. These uniquely spiritual and luxurious works are often seen and used as decorative arts initially but in time transition as mandalas when a deeper connection to the higher self occurs within the beholder.